"I got you early, huh?" Regina King says. She's calling from New York on a recent weekend and the time difference makes it so that it's exceptionally early in L.A. "Well, you don't sound right out of bed. Sometimes when I'm doing those radio interviews from the West Coast, I'm literally in bed. Like, curtains drawn. I know they can hear in my voice that I'm in bed." King has had a few early mornings, herself, of late: There was the morning of the Independent Spirit Awards nominations, when she was nominated for Best Supporting Actress for her sensitive, soulful work in If Beale Street Could Talk, Barry Jenkins' adaptation of James Baldwin's novel about young love, false accusations and life in 1970s Harlem. The week we talk, King has won awards from the National Board of Review and the New York Film Critics Circle. Soon after, she'd pick up a Critics' Choice and Golden Globe nomination and a win from the LA Film Critics Association. On the phone with ET, King discusses what's keeping her grounded throughout awards season and why no snub could tarnish the beauty of Beale Street. Regina Hall: I know! I saw that. That's so fantastic. I texted her and I said, 'Oh, we're really gonna confuse their a**es now!'" 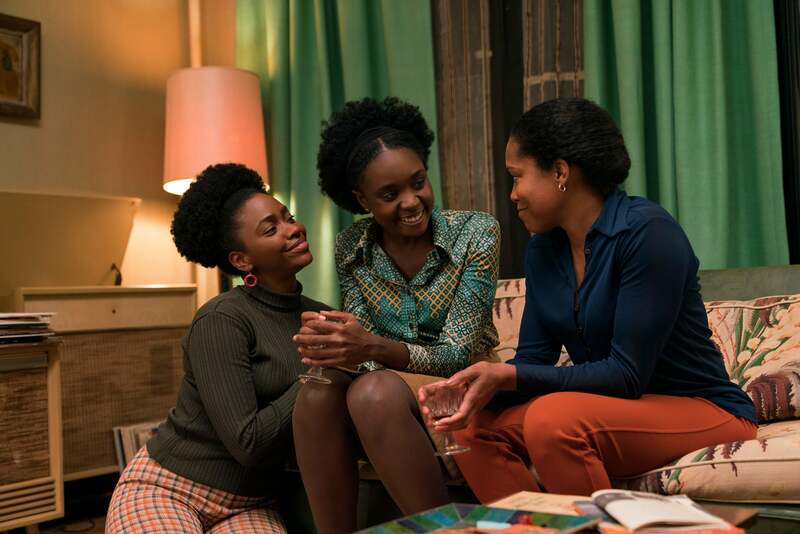 To go from the Emmy win to such a great reception for If Beale Street Could Talk, what has that been like? Do you have one standout memory now, looking back on Emmys night? Yes, and it will always be the fact that I was literally trying to get up to clean this lipstick off my dress before my category and just cursing myself because I had no business going in my purse to get my phone to Google somebody. That's why the lipstick popped out of my purse. That was like the universe laughing at me like, Put your phone back. The standout moment for me was just sitting there like, See? You just had to go for your phone. Then hearing Leslie [Jones] scream my name was like-- Ughh! You're kidding! That moment was a series of unfortunate events that turned into a series of fortunate events. And who were you Googling? I cannot tell! I am not saying that! I am not going to say. But it was a person I wasn't quite sure-- I didn't know quite what else they had done, and I just wanted to see what they had done. It could have waited. It could have waited! Those damn smartphones. If I had just an old-school flip phone, it would not have happened. We need to get you back on a Motorola Razr. 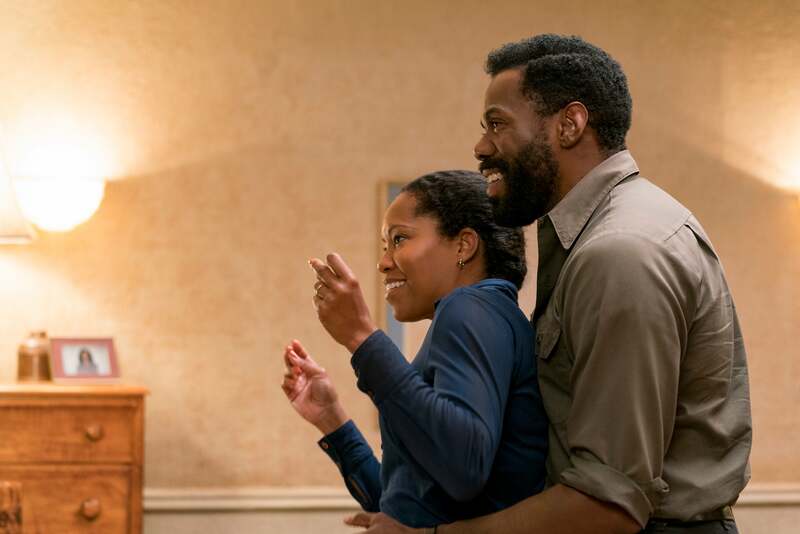 Knock on wood, but this week is Golden Globe nominations and, very likely, you could be nominated for both the series and Beale Street. [Note: She did.] Is this moment in your career feeling like a stroke of luck and good timing, or the culmination of a lot of hard work? Or both? I would say both, but I'm going to lean more to a lot of hard work. And a lot of commitment to the gift that I was given. You know, God blessed me with this form of art as my talent, and once I really realized that this was not something that was just a hobby, but something that I was meant to do and experience, I've never let it go and I've continued to respect it and to nurture it. Getting into Beale Street, how did James Baldwin's story come into your life? Had you read his novel before? Or was it through this project? I had not. I read Beale Street after I read the script. It was like a couple days after. I didn't want to meet with Barry until after I read the book as well. I was definitely familiar with Baldwin, but I had not read Beale Street. What was it about this character that spoke to you? And what was it that made you feel you could embody her? I think it was the story overall. Reading the book and the script, Barry was able to pull even more of the love up in the script than in the book. And I felt like my grandmother, [Loretta], was Sharon. She was the person who the neighbors, the people at church, the family, you wanted Loretta's approval or Loretta's energy around whatever it was you were doing because you knew it was going to be all right if it was. And that's kind of who Sharon is to me. So, it was the opportunity to play that woman that so many of us know, that family that people who did not have that support in their family, always attached themselves to those type of families. And Barry's ability to tell stories and show us as Black -- young people, older people, middle-aged people -- and how we love on each other and how our love gets us through things, he has just such a unique ability to do it so beautifully. And I wanted to be a part of that. In terms of his directing, is there something that you would say is uniquely Barry? Something that he does that no other director does or that he does particularly well? Gosh, it's more of the experience and it's hard to just put it into just a thing. Because it's an entire thing. Who he is and his entire approach is what makes him so unique. His ability to create a safe space in such a calm way. You're relaxed. Usually, sure, your nerves are up, because you're performing. For most of us, that's always gonna be. But I just trusted every single choice that he made. There was never really a moment of me going, "Mhm...Can we try it like this?" Maybe it was because of the conversations that he has with every actor, with every crew member before. He's very clear with what he wants. He's able to articulate that well and he's able to share really quickly when you've done something or when you've suggested something that opens up his initial idea even more. I don't know. The entire experience of working with Barry is just unique. I can't compare him to any other director. I can't say, "Oh, this is kinda like this director... " He's just a unique individual, just a graceful human being. You share this maternal relationship with Kiki [Layne] onscreen. And this is her first movie. What relationship did you develop with her while you were filming? I have to assume it meant a lot to her to be working with such an established actress like yourself. I think, for Kiki, for this to be her first film, she came to the entire experience humble and understanding the responsibility of saying James Baldwin's words and the opportunity to be led by Barry. She was very much aware of that. That awareness, she just soaked it in. [You] never got the feeling that she was a 20-something-year-old who thinks they know it all. She's an artist first and she led with that. It was a joy for me, as well as for her, I'm sure. Were you able to have conversations with her about what it means to be a woman in this industry or pass on any advice? Was there room for that? Absolutely. Absolutely. There were conversations that we had, just, you know, things for her to look out for her. Kiki is lucky because this first experience out was with a lot of seasoned actors who respect the process and respect everyone involved and know that we can't do it by ourselves. That's what she got to see as an example the first thing is. I feel like it's going to make her better, as she continues her journey as an actor. I think there are a lot of young actors, who the first time around, they're around a lot of bad behavior, so that's what they know. But that was not Kiki's experience. She was able to be with Colman [Domingo] and myself and Michael Beach and see these people, who she's seen in projects prior to now, be collaborators, be team players, and that's just going to lay a really wonderful foundation for her. What does it mean to you that this movie is coming out when it is? It means that we have a lot of reckoning to do as a country. [Laughs.] It means that Baldwin's words are as powerful now as they were 40-something years ago. We talked about the Emmys and Golden Globes and we're about to enter full-swing awards season with many calling you a frontrunner for the Oscars. Is that something that you can at all predict when you're watching a film of yours? Are you able to watch your performance and think, "I did a really great job there. I am proud of that work"? No. Honestly, most of the things that I've done I have not watched. I watched this because [producers Dede Gardner and Jeremy Kleiner] were like, "You have to see this film!" And they were right. I think this is a film that we all need to see right now. But am I looking at it like, Oh, this should win an Oscar! No, I'm looking at it like, this is an amazing piece of art and a love story that people need to see. We've seen a lot of movies that win Oscars that weren't necessarily your favorite movie. So, if we based it all on that, then none of us would work, right? If that is something that does happen, if we can get a Best Picture nomination, sure, that's fantastic. But is that going to take away from all of this beauty that we were able to come together and create if it doesn't? Absolutely not.